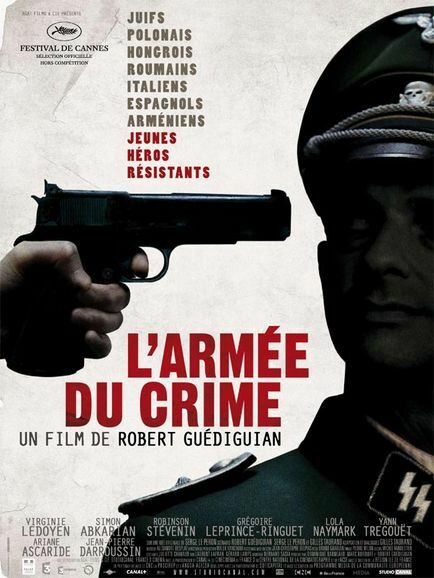 Robert Guédiguian‘s movie L’armée du Crime or The Army of Crime is one of the best war movies I have ever seen. I already said that it entered my Top 10 immediately. The question that remains: which one I am going to kick out? I’ll have to think about this later. For now let me tell you why I think The Army of Crime is such a brilliant piece of filmmaking. Apart from being based on actual events and being historically very accurate it is beautifully filmed. The actors are outstanding. The protagonists are heroical like not many but at the same time the movie doesn’t shy away to point its fingers not only at the Germans but also at the extremely shameful role the French government played during WWII. We had the heroism of the Resistance and Partisan groups on one side and the cowardly collaborators in the government, the police and among normal people on the other side. Shame on all of them. The movie shows all these aspects, nothing is hidden. This is the third French movie I have seen in a short period, L’armée des ombres aka The Army of Shadows being the first, The Officers’ Ward aka La chambre des officiers the second. I must say these movies manage something that not many others achieve. They get under your skin. You don’t only watch these movies, you live them. They don’t let you indifferent. Especially not this one. 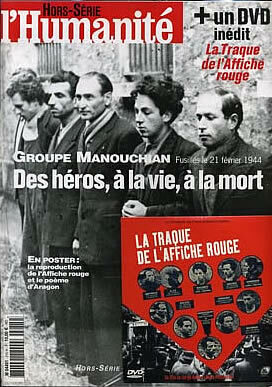 1943, Paris, the Armenian poet Missak Manouchian (Simon Abkarian) becomes the leader of a special unit of the French Resistance. His people, men and women, are all very young immigrants. They are Hungarian, Polish and Romanian Jews and Spanish, Italian and Armenian Communists. They decide to form a group and fight for France, the country of the Human Rights, to free and to defend her. They are determined and well-organized and soon will be declared enemies number one. The German occupiers and the French police strike back savagely. They hunt them and use every possible way to capture and destroy them, be it bribery, torture or coercion. In the end they are betrayed and all of them are shot. The movie tells not only the story of the group and their actions as a whole but shows many intimate portraits of all the individual members. I have hardly ever seen a movie displaying so much diversity. This is underlined by a brilliant score with influences of the music of all the different countries that came together in this fight. The torture scenes are very graphic. We are not spared anything. The most incredible is that with the exception of one person none betrayed the others. Not even under the worst of torture I have ever herad of. While they were operating in the underground most of their families were being deported to camps. Manouchian is an exemplary man. A larger than life character. He does not use arms lightly unlike some of the other reckless young people. He is a poet, an orphan, a gentle man, married to a beautiful French wife, Melinée (Virginie Ledoyen), whom he loves dearly. I would like to urge each and every reader to watch this movie as my words will never really manage to convey its utter beauty. It is also worth mentioning that we see a lot of Paris. The Army of Crime is one of those very rare movies that are, simply put, masterpieces in which every element is perfect. This entry was posted in Film directors, French, History, Movie, Resistance, Reviews, Top Ten List, Trailer, True Story, War Movie, Women in War Movies, WWII and tagged Female Resistance Fighters, French Resstance, History, L'affiche rouge, L'armée du Crime, Missak Manouchian's group, Movie Trailer, Movies, Reviews, Robert Guédiguian, The Army of Crime, True Story, Virginie Ledoyen, War Movies, Women in War Movies, WWII. Darn it, Netflix does not have it available yet. No telling when I will get to see it. Too bad. I have a feeling you would not like it as much as I did but you would like it. I read a few harsh reviews and had the feeling the people (mostly British) did not get that it is a true story and they didn’t even get its very open criticism of the French government’s cowardly behaviour. It’s about time we accept it. Just came across the film “Stranded” today (set in 1960 Algeria) and wondered if you’d seen it yet. I haven’t but it looks worth catching and since it’s your focus, here’s the title. No I haven’t. Thanks for telling me, I will look it up. That is, I did look for it on IMDb but noting came up… Will check later, yes, I’m definitely interested. Finally saw it. Your glowing review is justified. It is an excellent movie. Very crisp color. Well-acted. I am assuming these are well-known French actors. Some intriguing characters, especially Marcel. I loved the fact that it brought to light a forgotten aspect of WWII France – there was a Communist resistance alongside the regular underground. It points out the astounding fact that many Frenchmen in authority preferred the Nazi occupiers to the threat of communism in France! How can you fear an idea over a brutal reality? This was a much better movie than “Army of the Shadows”. It is also better than “Black Book”. BTW I did not find the torture that graphic unless you filled in the blanks with your imagination, in which case it was horrific. Did they say what happened to Marcel’s girlfriend? I hope she got what she deserved. Virginie Ledoyen Is a famous French actress but most of the others are not as they are not French. It is outstanding. But this movie would never have been possible without L’armée des ombres… Zwart Boek is tacky compared to this. I liked it until I had seen this one. Thanks for the info. I agree that Black Book is tacky, but trashy fun. Can’t you like both? I would certainly argue that Hollywood leaves too little to the imagination, but modern audiences do not have much imagination, I suppose. We require the graphic arm severing with spurting blood instead of the sword slashing downward and a cut away. I actually didn’t think Zwart Boek was trashy, just not as good as L’armée du Crime. Second best is probably Flame & Citron followed by Max Manus. The complex strategies of the French communist party’s clandestine command before and after the German-Soviet pact are hardly evoked. The odd result is that these people’s political committments seem totally out of the equation, and produce no interference of any kind. We’re left with archetypes of ‘soon-to-be victims who decided to take a stand together’, which is of course quite moving and has an universal appeal, but seems rather simplistic when it comes to the choices they had to make or had to cope with. Thanks for your interesting comment. I never thought of comparing Black Book and L’armée du Crime but it makes sense. I watched Black Book first and the “Flame and Citron” and “Max Manus”. Compared to “Flame and Citron”, “Black Book” is almost cheerful. L’armée du crime had a lot what made me love it. I see what you mean about it being somewhat simplistic, still I think this movie like Sophie Scholl manage to give you back some hope for humanity and that’s why I liked it plus the fact that the group was composed of immigrants. I need to rewatch and review Black Book. We seem to agree on two qualities of L’armée du crime: it is full of hope, and it doesn’t avoid at all the ‘strangeness’ of its heroes. The parallel you’re drawing beetween this film and Sophie Scholl is quite interesting, since I did appreciate those qualities here as well… but have the same reservations. I’m certainly biased about The Black Book. To me, Verhoeven is a master in the art of expressing his own grim views on human nature, whatever the subject. I do not share the general misanthropy, but I appreciate that his dark insights might reveal, particularly in historical situations like these, a side of our nature we often don’t want to be confronted with. By the way, Starship Troopers is in my view an excellent film about war and politics. Thanks for pointing out Flame and Citron and Max Manus, I haven’t seen them so they’re now on the watching list. I tend to be too pessimistic that’s why I’m glad when someone manages to show people who are idealistic. I hope you will tell me what you think of Flame and Citron. It’s very bleak but iI thought good. Some people have criticized it because it’s quite glossy and some, in my opinion, small details are overdrawn. It’s a true story, so a lot is true but not all. I’m a huge mads Mikkelsen fan and he is great in this. Max Manus is much more cheerful. Interesting to know you liked Starship Troopers. That really didn’t work for me at all.